Taking apart my bookcase for the move, like with everything else, I saw how filthy it got from being in my last place, especially since it was so close to the window (which btw I never even opened). I wasn’t too excited to use it in this new space but took it with me anyway. I mentioned that the bed frame I have doesn’t fit this new space, so I’m selling the bed and am going to make a platform bed using the old bookcase. I am hoping to get this done by next week so I’ll let you know how it goes. So this leaves me with no bookcase and while there were many I’ve seen that I love, like this one from Ikea and this one from Muji I need to keep budget in mind and this is an easy thing to save money on. Then I found the above Ikea Hyllis shelving units for $15.00 each!! I love the industrial look, and the size is perfect 11″D x 23″W. 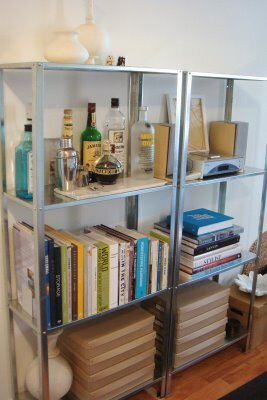 Building your own platform bed from bookcases is brilliant! Can I just say: whenever I feel overwhelmed by my own decorating/organization decisions (on a budget), it’s refreshing to read the ideas here. What is the name of these shelves?, they look great! and I can’t wait to see how you organise your new space! i am in AWE of how neat and tidy your space is! what kind of bookends do you use to keep the books from toppling off side of the shelf? the bookends are from muji. they aren’t on their website but are available in their stores and at the MoMA Store. I am thoroughly inspired by your organizational skills and look forward to reading about this transition! It took me a minute to realize that that was a picture of 2 bookcases, and not 1 next to a mirror! I don’t know why my mind automatically hopped to “mirror” but whatever :) I LOVE your blog! I saw your posts on Apartment Therapy and it’s inspiring how you are able to create beautiful, organized homes in such small spaces! Keep on posting! Are those archival storage boxes at the bottom? If not, what are they? If yes, is there a brand you prefer? the boxes aren't archival quality, they're the Natural Office Storage Boxes from the container store. i like these for me (my clients don't always agree) because i like the way they look, and since they're cardboard, when they've seen better days i can simply recycle them. though i've had them for many years, and they still look great. otherwise, most my clients go by the look, and color. i don't have a particular brand i prefer….